If you are in any doubt as to whether your tyres are safe and legal, bring your vehicle along to us for a FREE, no obligation tyre health check. 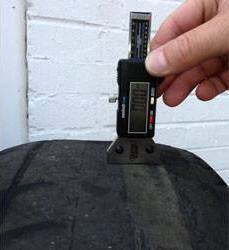 - the grooves of the tread pattern of the tyre have a depth of at least 1.6mm throughout a continuous band comprising the centre three-quarters of the breadth of the tyre and round the entire outer circumference of the tyre. Failure to comply with any of the above could result in a fine of up to £2500 and 3 penalty points on your licence.